Walking around London it is easy to see many of the major changes to the city. The constant building, new towers adding to the skyline, however sometimes small changes can go unnoticed although they still have a profound impact on the character of an area and memories of the past. 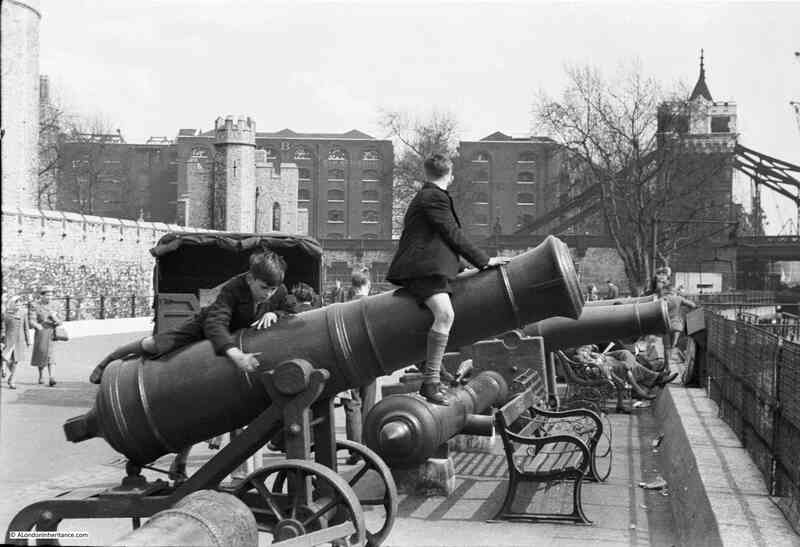 One such change is the disappearance of the cannon that once lined the walkway running along the River Thames in front of the Tower of London. I had not really noticed how much had changed until I was looking through some of my father’s photos and found the three photos from 1947 that I feature this week. In the first, a range of cannon lined the river. I remember these from childhood walks and school visits, and for years before they had been a feature that no visit could ever have been complete without climbing one of these cannon. I walked down to the Tower one recent Sunday to see how much had changed. The weather was dull and rain was expected, so the lighting was not that good. The following photo is my 2015 photo from roughly the same position. The majority of the cannon have been removed, although a couple remain, looking rather sad up against the approach to Tower Bridge at the far end of the photo. I do not know when they were removed or why, I can only guess. Perhaps health and safety considerations, although falling was an accepted risk of climbing anything as a boy. An understandable reason could have been damage to the cannon. Making more space in this area is possible as it really does get crowded at the peak of the tourist season. 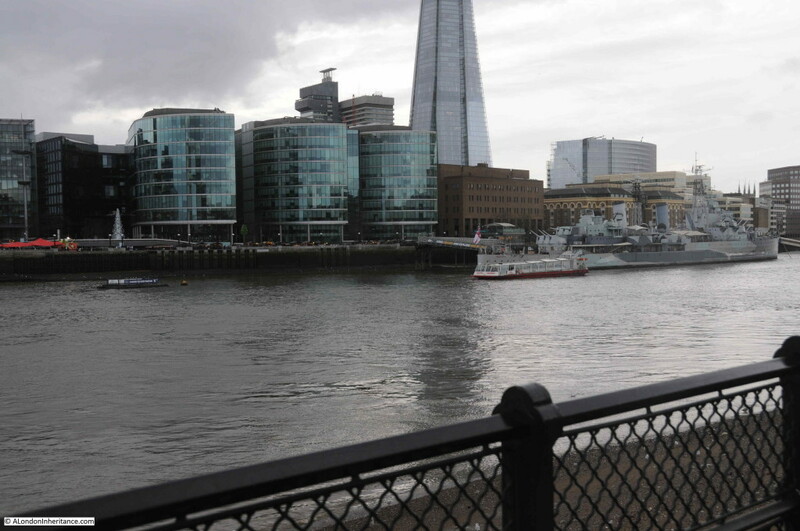 Or perhaps the fact that they all seemed to be pointing directly at City Hall on the south bank of the river may have made certain occupants rather nervous. What ever the reason it is a loss of some of the character of the place. Standing at this point, it is fascinating to consider the incredible amount of change that the Tower of London has seen during the centuries. Just in the last 70 years the changes have been remarkable. Whilst here, my father also took the following photo. 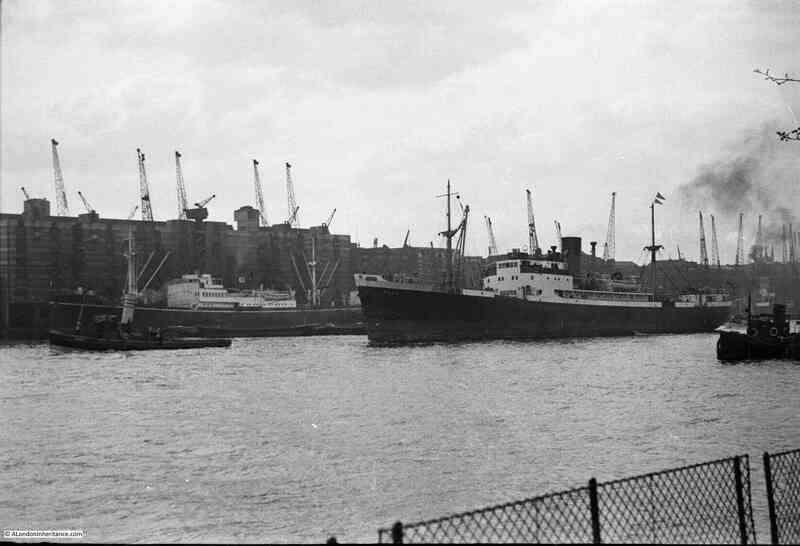 I do not think this was to capture the south bank of the river as the warehouses must have seemed a rather fixed feature of day to day London activity, rather it was probably to photo the ship that was about to pass under Tower Bridge. What the photo does show is the amount of change along this part of the river, which in 1947 still consisted of rows of cranes and their associated warehouses along with a steady stream of cargo ships mooring alongside. The warehouses on the left of the photo are the ones that lined Pickle Herring Street which I featured here. The following photo shows the same scene today. I was able to position the photo accurately using Southwark Cathedral. If you look to the far right of both photos, you can just see the four spires on the top of the tower of Southwark Cathedral. 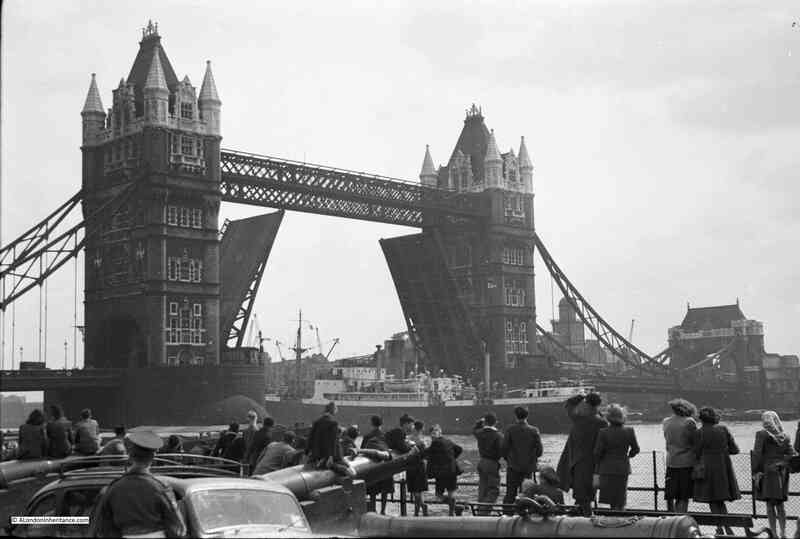 I doubt that anyone looking across at this view in 1947 would have expected this scene to host Europe’s tallest building in the decades to come. The next photo my father took followed the ship as it passed under Tower Bridge. It was just about to pour with rain when I took the following photo so the lighting is very poor. Apart from the missing cannon, the scene is much the same today. The top of the old Anchor Brewery building behind the southern approach to Tower Bridge provides a convenient reference point to get the right position for the 2015 photo. 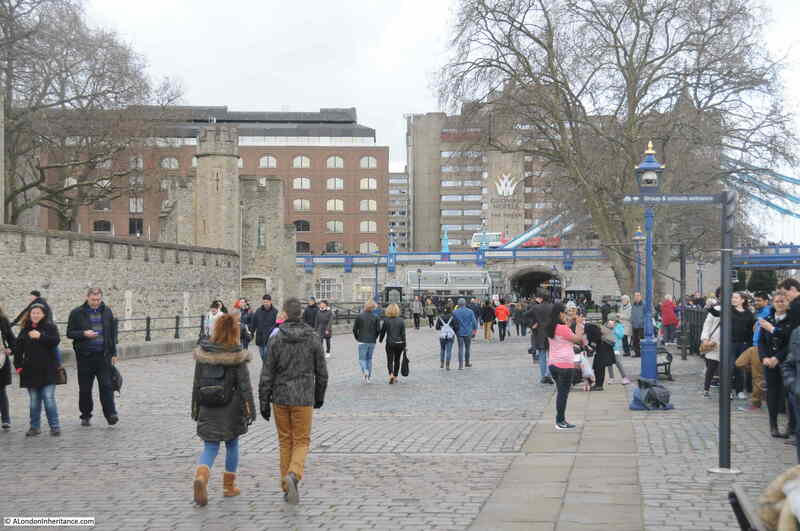 The walk between the Tower of London and the River Thames is still a great place to watch activity on the river and the view along the south bank, however with the removal of the cannon it has lost some of its character and childhood memories. 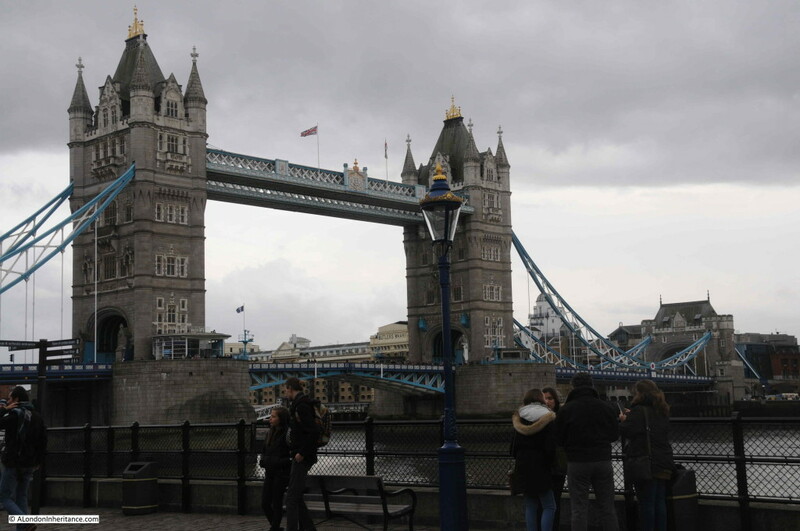 This entry was posted in The Thames and tagged Cannon, River Thames, Tower Bridge, Tower of London on December 27, 2015 by admin.